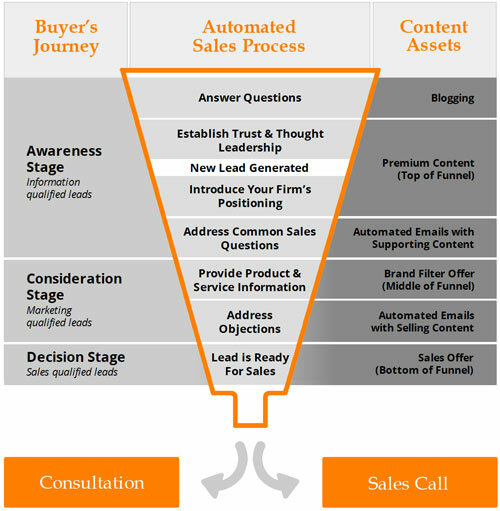 The top of the sales funnel is where potential customers encounter you for the first time. This includes material like blogs and social media posts which really can help with driving sales for manufacturers. Companies and executives are on social media - and you should be too. Social media offers a way to connect with others on a more personal level... and show yourself as a person, not a faceless, mindless producer. First and foremost though, it's an effective channel for distributing content such as your blog posts to a relevant and engaged target audience. Effective content marketing in the manufacturing industry requires a strong selection of material once you've caught the interest of others. Once they're interested, you can offer eBooks. Customers like it when you make things easier for them - and imagine how much happier they'll be if you offer some free books detailing everything they need to know about manufacturing. Don't let these be dry and dull, either - try telling a story. You know how I just said to make things easier for your potential customers? This is that, except even more so - the right checklists and guides can help potential buyers organize all of their information before they even contact you. This allows you to streamline the negotiation process and help them avoid common mistakes - and they will love you for it. At times, you need to speak with more authority on a subject - and white papers allow you to do that in a concise and professional manner. Briefly explain your services and pricing models. Consider providing several realistic examples that are focused on the consumer's benefits, not your own. These are another way of getting people involved - even if you're not running them live. A proper webinar system makes content marketing in the manufacturing industry a much more practical method of doing things than many people expect. Seriously, though, don't just monologue for thirty minutes - make it interactive and offer slides, buttons, and other controls to help keep your viewer involved. This could be everything from a virtual tour of your facility to a showcase of your manufacturing process. Companies looking for a manufacturer have a universal problem - they don't have a manufacturer. Case studies are an outstanding way of explaining to other companies why you deserve their business - you could highlight how you resolved an issue, created something abnormally complex, or helped make significant cost savings for your customer. There are a few things that are relevant no matter when they appear in your marketing strategy - and these are more important than anything else here. First, your content should be benefit-led. It's not about you, and it's not about your company - it's about your customer and how you can help them. The more you focus on solving their problems and meeting their needs, the more likely they are to do business with you. It really is that simple. Second, all of your content should establish your authority and help you build a relationship. Ideally, potential customers will see you as the experts in your field of manufacturing - regardless of what you make or the scale you operate on, being seen as experts will make you their top choice.